Hummingbirds are a variety of wildlife that are attainable in any area, with the provisions necessary for their survival. 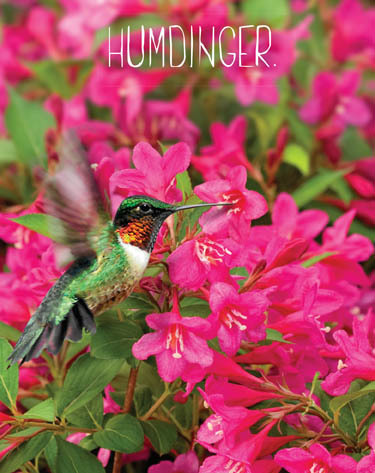 This can be accomplished through the creation of hummingbird gardens. The variety of hummingbird attracted to a garden is dependent on the regional area. Gardeners east of the Mississippi are only visited by the ruby-throated hummingbird, while Western gardeners usually are visited by seven different varieties. Although hummingbirds eat tiny insects, their preferred food is nectar, which tends to be most abundant in trumpet-shaped flowers. 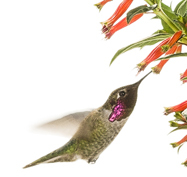 Although they will feed from other flowers, blooms that are reddish or purple in color are most attractive to hummingbirds. Hence, gardens containing a large number of desirable flowers are most attractive. Fragrance is not an essential element, as the birds are attracted by color. Choose varieties that will be in bloom when hummingbirds are in your region (typically the warmest months of the year in northern regions). A hummingbird can be characterized in several ways, most notably by their small size and the fast pace at which their wings beat. Hummingbirds are attracted to the color red. Because their wings beat unusually quick, hummingbirds use extreme amounts of energy; making it necessary for the birds to feed every 10 to 15 minutes from dawn until sunset. Hummingbirds are territorial and will guard prime flower plantings. One dominant bird often drives others away. If you want to encourage more hummers to take up residence, plant several different hummingbird gardens in your yard with plenty of distance between them. Hummingbirds will also drink sugar water from specially constructed feeders. The container is usually red, making it attractive to the birds. The sugar water solution is relatively easy to make at home, a combination of 1 part sugar to 4 parts water. After combining, bring the solution to a boil and then cool before placing it in the feeder. Boiling it will keep it fresh for a longer period of time; however, if the feeder is not emptied quickly, change the solution within a few days. Honey is not a recommended substitute for sugar, as it ferments and spoils too quickly. You got my attention when you said that hummingbirds are attracted to color red and drink sugars from specially constructed feeders. My husband and I are looking for ways to attract hummingbirds in our garden. We want them to feel at home in our garden, so we'll make sure to shop for handmade hummingbird feeder that has shades of red. Thanks!